The prequel to his Oscar-winning Lord of the Rings trilogy, starring British actor Martin Freeman as Bilbo Baggins, is due out in cinemas in December. The new film has been shot at a rate of 48 frames per second, compared with the industry standard of 24 frames. However some attendees claimed the scenes looked like low-budget TV. In a video introduction, Jackson told the audience that using 48 frames per second produced a smoother image. "The movement feels more real - it's much more gentle on the eyes," he said. The footage included scenes featuring Bilbo Baggins lost in Gollum's cave, trolls engaged in battle and Sir Ian McKellen and Orlando Bloom reprising their roles as Gandalf and Legolas. Jackson said the new approach would take time to adjust to and some attendees agreed, branding the footage as a failure in digital technology. The Los Angeles Times said the footage was "hyper-realistic": "An opening aerial shot of dramatic rocky mountains appeared clearer than the images in most nature documentaries. "But the effect was different when applied to scenes with actors dressed in period costume, whose every move - and pore - was crystal clear," it added. One projectionist told the newspaper it "looked like a made-for-TV movie". "It was too accurate - too clear. The contrast ratio isn't there yet - everything looked either too bright or black," they said. However the Associated Press reported the footage was "vivid, with grass blades, facial lines and soaring mountains appearing luminous and pronounced. The actors looked almost touchable, as if they were performing live on stage". Other digital pioneers are making the same push for higher film speeds. Avatar creator James Cameron has promised to shoot the sequel to his science-fiction blockbuster at 48 or 60 frames per second. 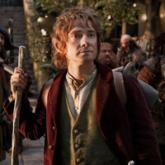 The Hobbit: An Unexpected Journey is the first chapter in Jackson's two-part adaptation of JRR Tolkien's fantasy classic. The two films were shot back-to-back in 3D, with the second part, The Hobbit: There and Back Again, due in cinemas in December 2013.